For millennia, Asdrubael Vect has ruled the dark city of Commorragh, crushing any who dare to cross him. His reach is long and his position unassailable... or so he thinks. A cabal of rebellious archons, allied with other darker forces, seek to unseat the tyrant and rule the city in his stead. But as their actions bring about a cataclysm and draw the attention of the mysterious Harlequins, they are cast into grave danger... and Vect is watching. 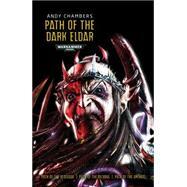 Author of the Path of the Dark Eldar series, along with the novel Survival Instinct and a host of short stories, Andy Chambers has more than twenty years’ experience creating worlds dominated by war machines, spaceships and dangerous aliens. Andy worked at Games Workshop as lead designer of the Warhammer 40,000 miniatures game for three editions before moving to the PC gaming market. He now lives and works in Nottingham.